Ladies & gentleman , I am so excited to share one of my ALL time favorite beauty weapons that I have in my arsenal of beauty tools. 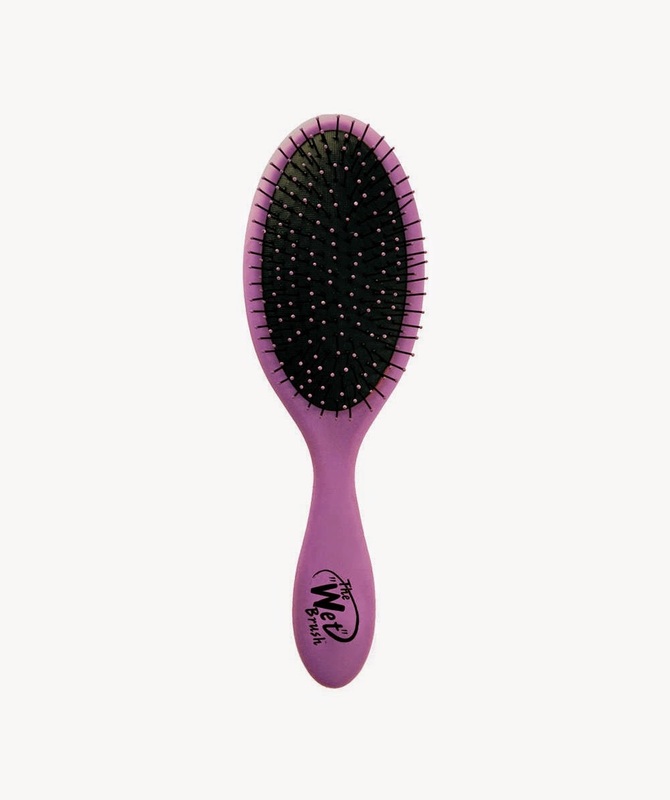 It is know as the “Holy Grail” in my house, aka – THE WET BRUSH. Now, if you do not have one yet don’t panic, okay panic a little because you’ve been torturing yourself AND your poor hair all this time, but all is well they sell them many, many places. They have them at Target, Ulta, and other beauty stores. They run about $9.00 and it will be THE best $9.00 you’ve ever spent on your hair! Let me give you a little more insight as to why I’m so infatuated with this simple brush. Believe it or not, I have very, VERY curly hair! And yes, you guessed it I hate it! Of course I get the cliche response, “Oh my gosh, you’re so lucky” and I think to myself (silently of course) “Yeah, I’m the winner! I have a nasty poodle on my head every morning that I need to tame, so lucky”. Don’t get my wrong I do love my hair and more than that I am EXTREMELY grateful to even have hair but that doesn’t change the fact that I have a real life animal on the top of my head. As well as being curly it is very thick, long, and coarse. I use to dread just the thought of washing my hair and then having to brush through it after the shower. That is until I found THE WET BRUSH! My sister said to me one day “Umm, do you have a Wet Brush” she is known for getting sold on the silliest things. So like I usually do I laughed her off and proceeded to tell her I wasn’t buying into another one of her gadgets! The next day I noticed she had accidentally left hers at my house from the night before. And you bet your bottom dollar I was going to use that thing! So, there I was soaking wet from the shower dreading the brushing of my wet poodle hair and all the sudden my hand kept sliding, and sliding, and sliding. I couldn’t believe my eyes, my hair, or my mind! I DIDN’T FEEL ONE KNOT!!! I barley, BARLEY felt the brushing sliding down my head! Once I was finished which literally took a fraction of the time it normally does to brush out my hair, I instantly called my sister and apologized for doubting her! Of course she demanded her brush back but I didn’t care I was out to buy all the Wet Brushes I could find (I’m currently sitting on 4). Now, on top of being wonderful for “Wet” hair it is just as fabulous on dry hair! I often times curl my hair and hairspray the life out of it so it’s not always the friendliest to comb through the next morning. Although, with the Wet Brush I don’t bat an eyelash. I also wear extensions sometimes which is a beast to comb through seeing that they often get tangled. But with The Wet Brush I don’t have one problem getting them unmated. I will go over more of my hair routines and extensions in another post. I have attached a link of where you could find them online if you can’t find them in your store. They also come in tons of different colors and even have a mini! How cute! Perfect for your purse! Best of luck brushing! Note: I was NOT paid or sponsored to do this post. I simply wanted to share with you guys one of my favorite beauty items that helped me with my hair and I hope will help you! I've had the wet brush for two years and I couldn't imagine my life without it. It's been a hair lifesaver for sure and has helped cut through tangle after tangle without pulling and breakage. LOVE THIS BRUSH! For two years! Man I guess I have been living under a rock! But I'm glad I know about it now! Yes, I totally agree I have stopped pulling chucks of hair loss out, thank goodness! Do you use this to blow dry, too?